Aeon's End is a cooperative deck-building game with a number of innovative mechanisms. Players will struggle to defend Gravehold from The Nameless and their hordes using unique abilities, powerful spells, and, most importantly of all, their collective wits. Designed by Kevin Riley from Action Phase Games and Indie Boards and Cards, Aeon’s End is right at home at Handelabra Games. The combination of deep strategy and cooperative gameplay is sure to scratch the same itch as our other games like Sentinels of the Multiverse and One Deck Dungeon. Aeon's End involves new mechanics like deck-building, a randomized turn order, and deep deck-management. The tabletop game also has a growing library of expansion content that keeps the game fresh over many plays. We are funding Aeon’s End development from a combination of sources, including Kickstarter for the final stretch. Crowdfunding is a great way to get fans directly involved, determine the market demand for a game, and help fund development of additional content. Who knows, there might be a few surprises in the stretch goals as well! 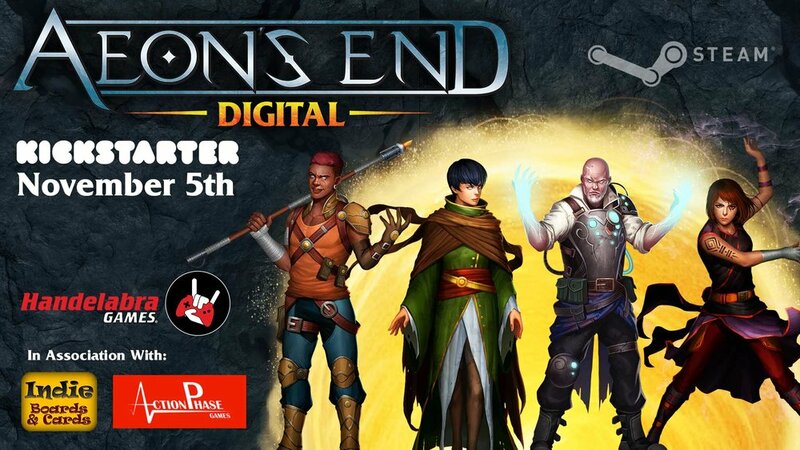 Aeon’s End digital will launch on Kickstarter on November 5th. Join our mailing list or follow us on Kickstarter to be notified when the campaign launches. You can also follow us on Twitter, Facebook, Youtube, and Twitch, and join our Discord to chat about Aeon’s End and all our other games. And don’t forget to bookmark AeonsEndDigital.com!